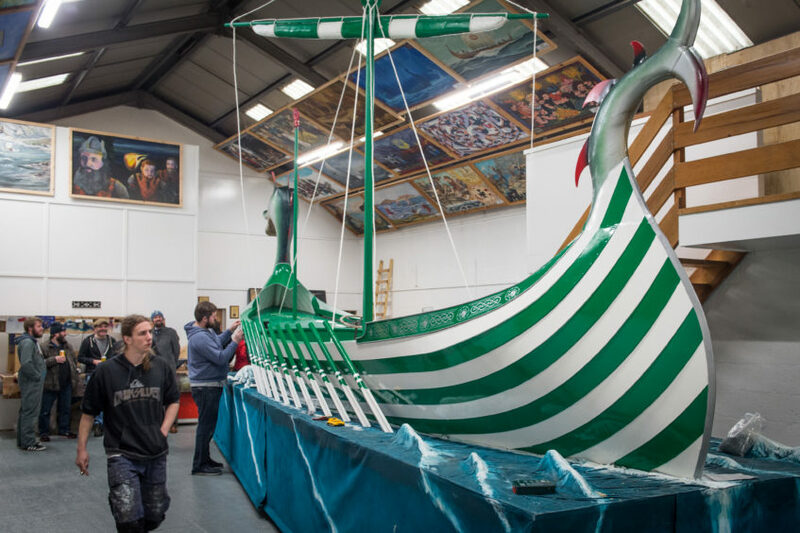 The huge galley will be paraded through the streets of Lerwick in front of thousands today for Shetland’s annual fire festival before being spectacularly burnt. 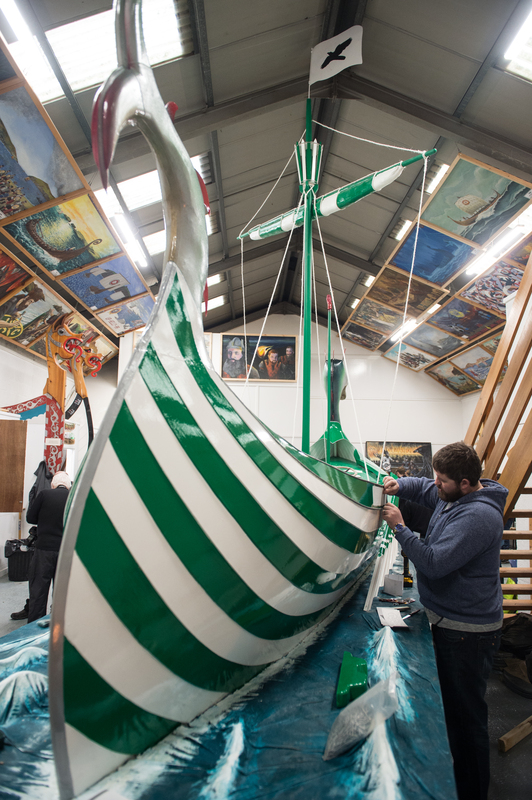 This year the ceremonial boat has been decked out in green and white hoops with a four-leaf clover beneath the head – homages chosen by Guizer Jarl John Nicolson in honour of his favourite football team Celtic. 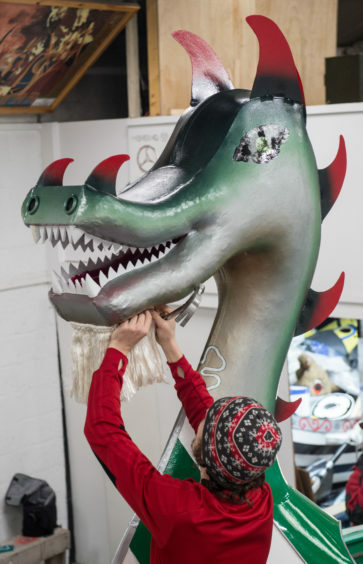 Today, the 48-year-old will lead the procession of nearly 900 guisers through his hometown before the fiery climax. 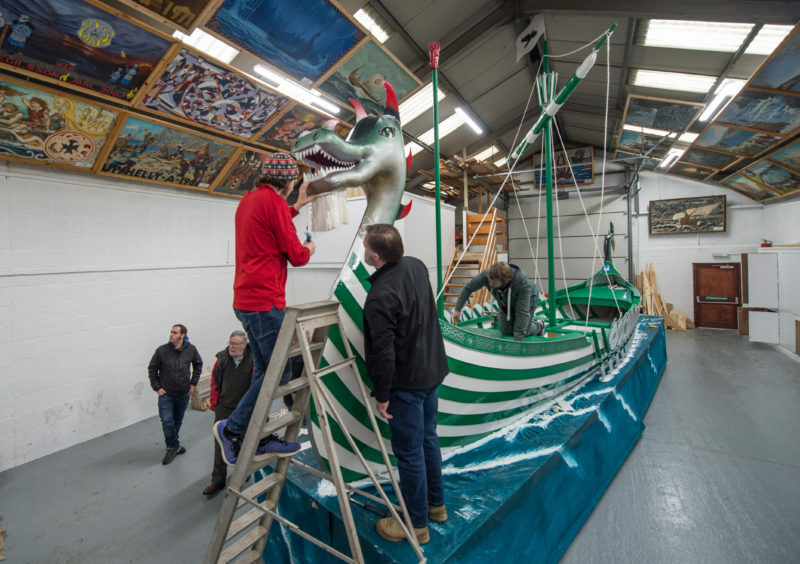 Yesterday, volunteers were putting the finishing touches to the craft before it joins the procession – which included using scissors on the figurehead’s beard for precision detail. 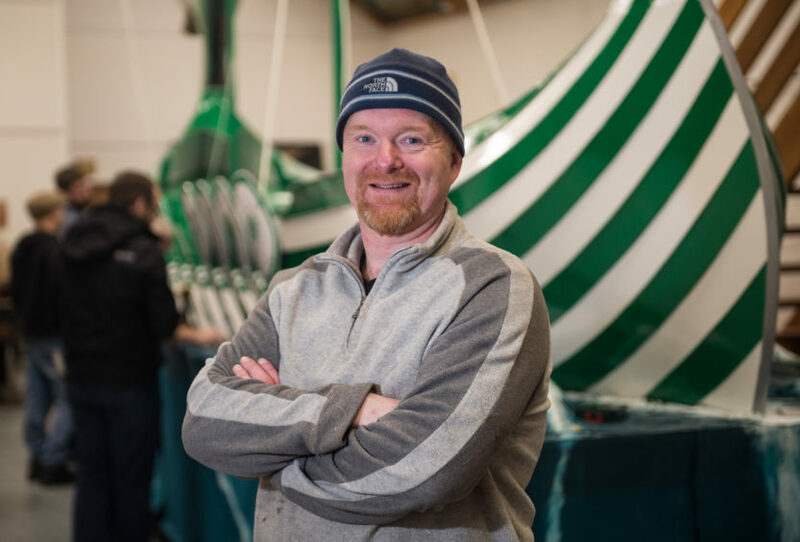 Among the crew helping to finish the boat was Mr Nicolson’s brother David, who led the event himself in 2012 – and he revealed some surprises have been hidden on the boat for this year’s Jarl to discover. He said: “John’s a Celtic fan, which is why he’s chosen the green and white, the Jarl chooses the design and that’s what he wanted. Mr Nicolson is the fourth member of his family to lead the festival – following his father Jim and older brothers David and Graham. 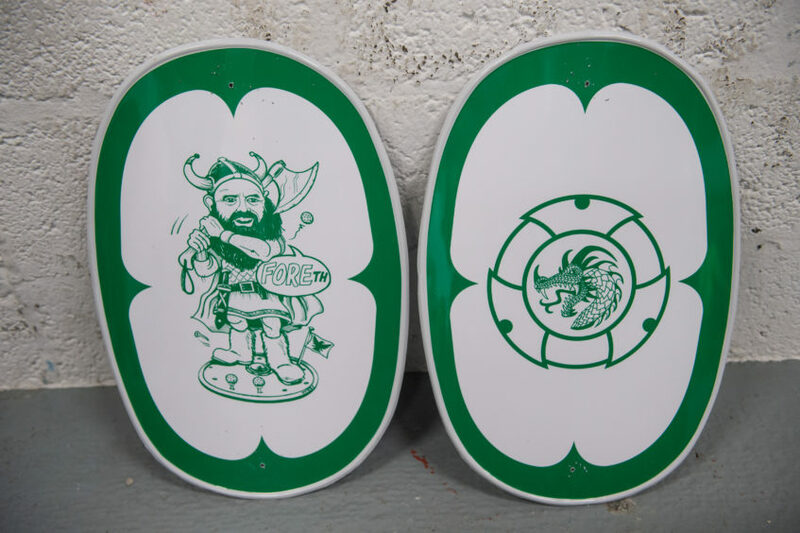 This year’s galley will include the shield designed by this year’s Jarl followed by those that were carried by his family. 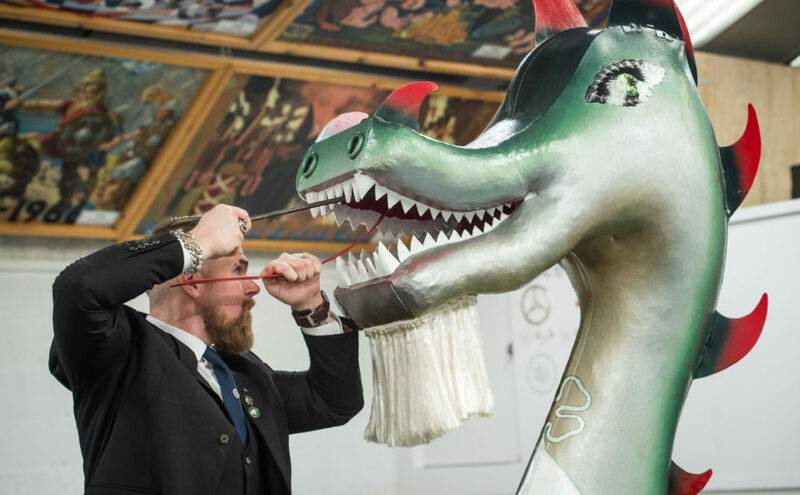 Alongside them is a cartoon drawing of Mr Nicolson screaming “foreth” while swinging a Viking axe at a golf ball to represent his passion for the sport and him being the fourth member of his family to lead the celebrations. 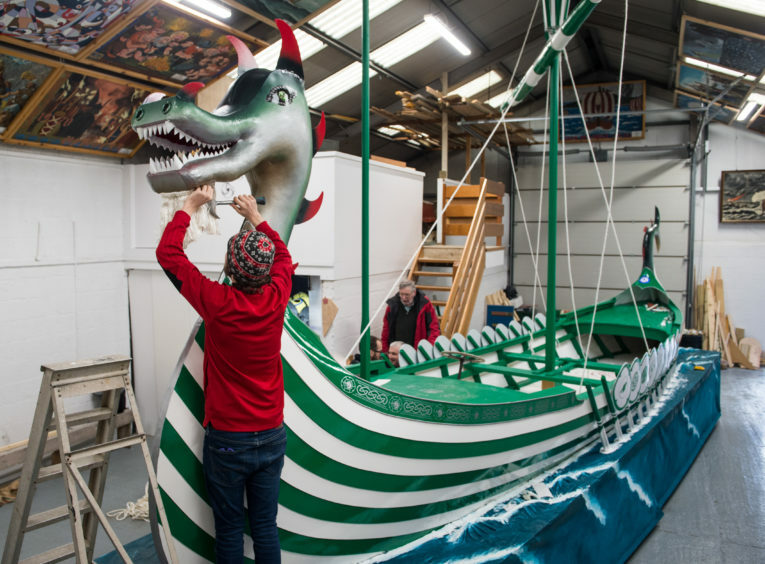 The basic design of the boat has remained the same since 1949 and construction of it began in October. 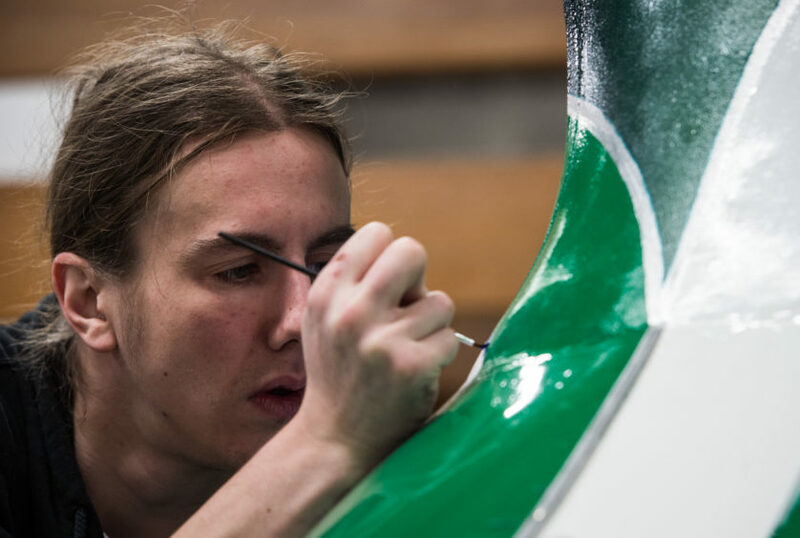 Galley foreman Ryan Leith said: “It’s great to know how much people care about it and everyone enjoys working on it. 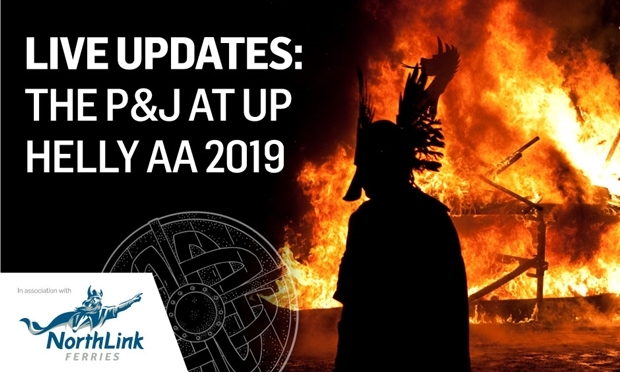 Squads of Shetlanders worked late into the night to ensure Up Helly Aa’s reputation as one of the world’s most spectacular fire festivals is maintained. 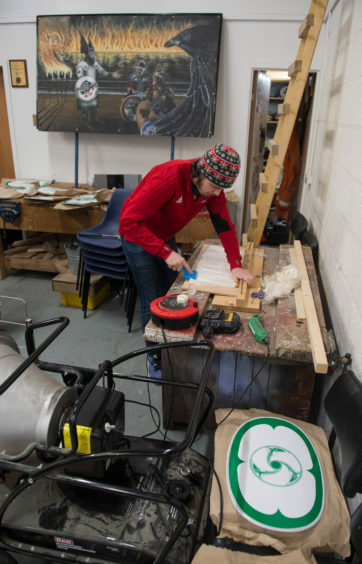 Locals and tourists teamed up at the Isleburgh Community Centre to ensure that more than 1,000 torches prepared for today will burn brightly in the night. Crews formed lines to pass the weighty beams between three sheds set up for the operation. Hessien bags attached to the wooden poles are steeped in pools of paraffin for two hours before being shifted to make way for more. 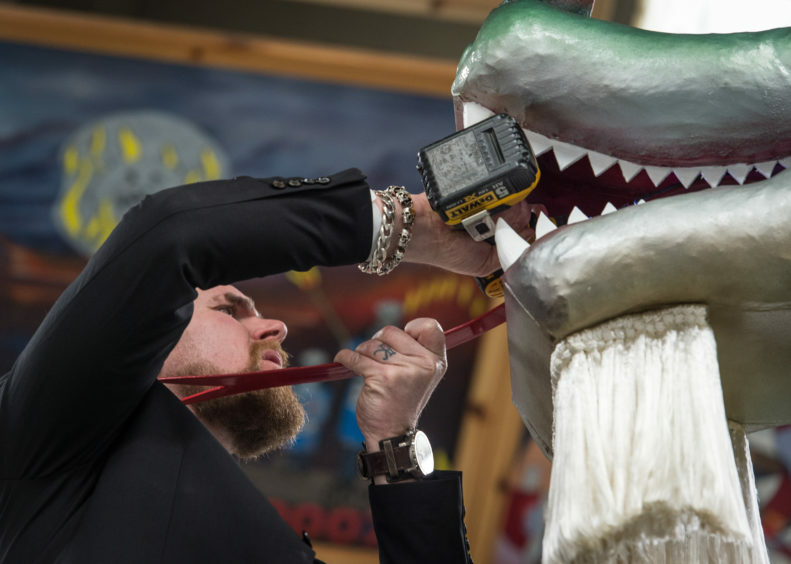 Concrete is brushed onto the stem to prevent the entire torch going ablaze. The team began the soakings on Saturday and continued yesterday amid celebrations that included live music. Torch foreman Ryan Wright said: “There’s a lot of forward planning that goes into it. “It brings everyone together, particularly people you might not see through the year. There’s a certain group of guys that always come out.